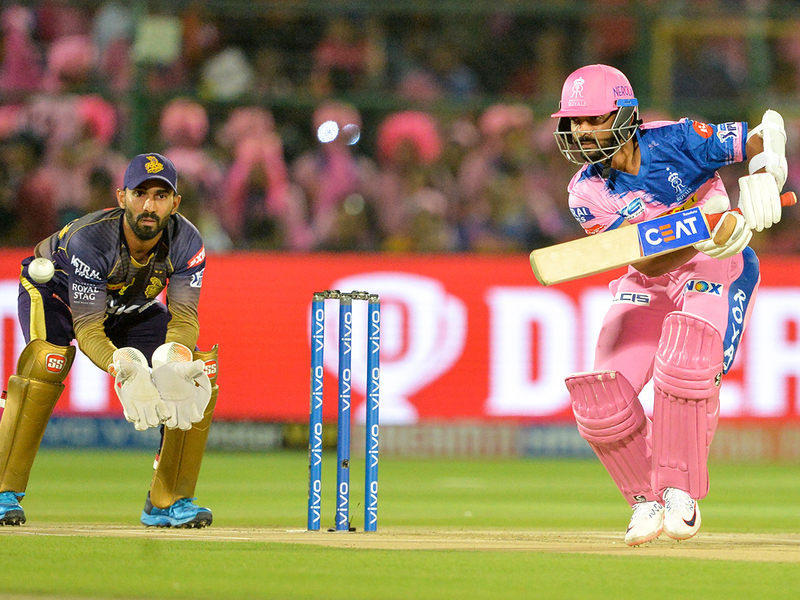 Jaipur: Rajasthan Royals might have lost four out of five matches in the ongoing IPL but captain Ajinkya Rahane feels there is no need to hit the panic button just yet. After restricting Rajasthan to 139-3 in 20 overs, Kolkata Knight Riders’ Sunil Narine (47) and Chris Lynn (50) tore their bowling attack to shreds, sharing 91 runs for the opening stand in 8.3 overs to reach the target with 6.1 overs to spare. “I think there’s no need for us to panic yet. Out of the five matches that we played, we lost badly in just one game. We played well in our last four matches, out of which we could have won three,” Rahane said at the post match press conference. “When you’re losing, you can risk overthinking. But when you’re winning, you don’t dwell on things that much. “It’s not too late for us. If we can improve and apply ourselves, the desired results will surely follow,” he added. “The set batsmen need to stay on the crease longer and take the game deeper, while also taking calculated risks. Similarly, the bowlers need to execute their plans based on the understanding of the wicket, and by observing the difficulties that the batsmen are facing with regards to playing any shots,” he explained. “It was important for us to post 150-160 on board, which we felt would be a challenging total on that wicket. We struggled to get to 140, which is possibly a learning for the bowling unit. While playing at home, we need to adjust to the wicket as soon as possible, while also being aware of the correct line and length that is to be bowled. A ball from Dhawal Kulkarni got an inside edge off Lynn to hit the stumps but did not dislodge the bails. In fact, the ball travelled past the boundary ropes and was awarded a boundary in favour of the batsman. Rahane said he had approached the umpire and asked him to declare it a dead ball but to no avail. “The rules are rules. Having said that, maybe the boundary could have not been counted or it could have been called a dead ball. The game is already heavily tilted in the favour of batsmen. That was my conversation with the umpire. Though, there is no point of discussing aspects that we cannot control,” he said. “Ben has been a vital cog for us and he has an impact on match but unfortunately it did not happen this time. The way he bowled in the last match and has been batting I don’t feel his selection for this match was wrong. I am sure he would be performing in the coming matches too. “As a team we have to back our players. It is not that any particular player is to perform in every match,” he insisted.